Blame It On The Love (unofficial Bon Jovi blog): Hugh McDonald to be inducted into the Rock Hall? 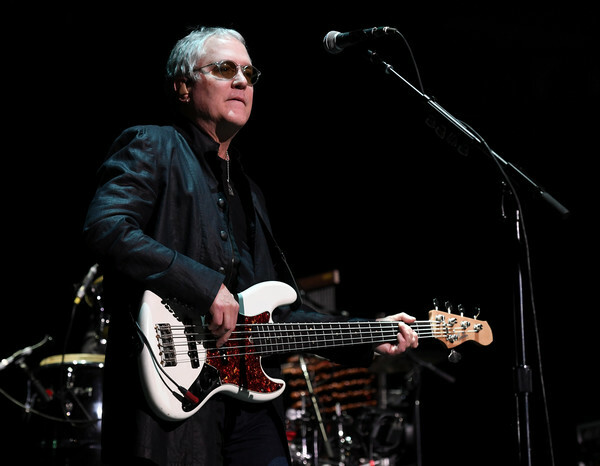 Hugh McDonald to be inducted into the Rock Hall? When the 2018 nominees for the Rock and Roll Hall of Fame were announced, the band members eligible for induction were also revealed on the Rock Hall website. For Bon Jovi, it would be the original five: Jon, David, Tico, Richie, and Alec. I understood why, but have always maintained that if Bon Jovi got into the Rock Hall, Hugh McDonald deserved to be inducted with them. And I was quite upset that some people were saying no one but the original five had ever done anything worthy. But some eagle-eyed fans noticed in the last 24 hours that, if you click on Bon Jovi's inductee bio on the Rock Hall website, Hugh McDonald's name has now been added to the list of band members. Which hopefully means he'll be inducted as well. I can't adequately express how over the moon I am about that prospect. When David Bryan and Tico Torres were interviewed about Bon Jovi's impending induction, they said Hugh deserved acknowledgement for the role he's played in the band, so maybe they had something to do with this. Or maybe Jon pointed out to the Rock Hall that it was Hugh who played on the first ever Bon Jovi song and had played in the studio on the band's most important records. Who knows? I honestly had NO idea! I called Hugh and told him! Thanks for the heads up! It’s so exciting! I’m bawling like a baby! Denny Laine, an original member of the Moody Blues, was also quietly added to their page after initially being left out. UPDATE 15/03/18: This Deseret News article talks about how Jon appealed to the Rock Hall to get Hugh inducted. It was meant to be a Christmas surprise but the cat was let out of the bag when people noticed Hugh's name on the Rock Hall website! I guess this is a confirmation that Alec won't go to the ceremony. Sad.